Finally, spring is here! While it might not seem like it yet where you are living it is nice to know that winter will soon be a memory in our rear view mirror as we journey into warmer days, birds singing, frogs croaking and flowers blooming. Easter is right around the corner too, so be sure and use these upcoming days to create a few fun crafts to celebrate the holiday. 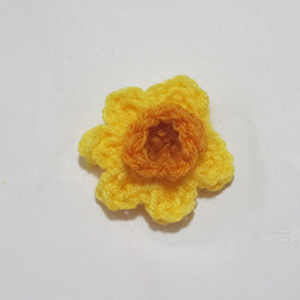 This versatile daffodil pattern can be used for napkin rings, as a pin or accent to a headband. I’d love to hear how you use this pattern. Leave me a comment below! St. Patrick’s Day is right around the corner. 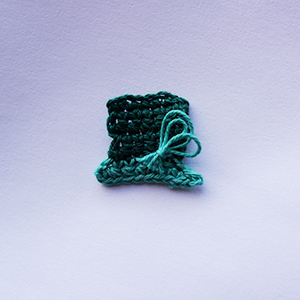 If you’d like to add a touch of emerald green to your wardrobe then crochet this quick and easy headband. The shamrock appliqué adds the perfect finishing touch to any emerald isle inspired outfit you might throw on for the holiday. This pattern is also great for children’s clothing or hair accessories. Don’t limit yourself to just the headband, you could make hairpins too. 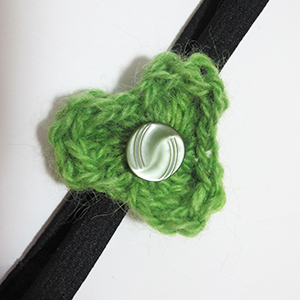 Simply crochet the shamrock, sew on the button and then hot glue the appliqué to a bobby pin or hair barrette. I like to have a variety of belts. If you could see my closet you’d know what I mean. Accessories are one of my favorite things. Isn’t it the same for most girls? This crochet belt pattern is unique in that you can interchange the belt depending on what you are wearing. 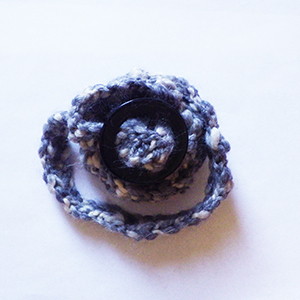 The example in the photo was made with bulky denim-looking yarn. Thanks to a small button with a shaft on the underside of one end of the belt it can be easily attached or removed from the buckle. It is also a great scrap-saver project. Make a rainbow of belts for the spring season ahead. I have always loved St. Patrick’s Day. My mom would make corned beef, sauerkraut, and all the traditional foods for our American way of celebrating our Irish heritage. While the food was delicious it was also a milestone in the year, which meant spring was right around the corner! After a long winter I was always more than ready to see my tulips again. This week I created this Leprechaun Top Hat Appliqué so you can start embellishing your linens or making pins for your friends. 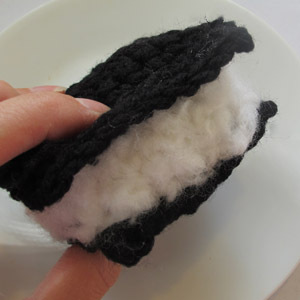 This is also a great project for adding a “touch of Irish” to kid’s clothes or hair accessories. It won’t be long and instead of snow we’ll be enjoying spring showers. I have a trusty pair of rubber boots that I love to tromp through the spring puddles in. I often where them to town or in the garden. When I wear them all day long the hard rubber can rub on my shins. 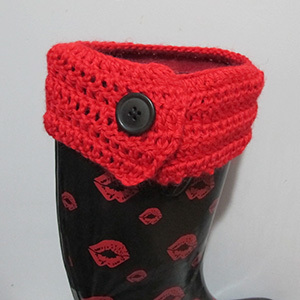 So, I crocheted these boot toppers to cushion my shins and for a chic update to my rubber boots. 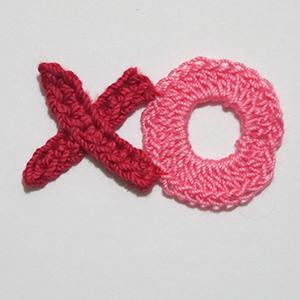 This project can be made in about an hour or less and it’s a great way to use up extra yarn. It’s also a great project for beginners. Make several in a rainbow of colors to suit your moods. There is something nostalgic about making your own valentines. I love going through antique stores and admiring all the many different kinds of vintage cards, some of which include gorgeous trims. It’s not too early to start making your own valentine cards for the upcoming holiday. 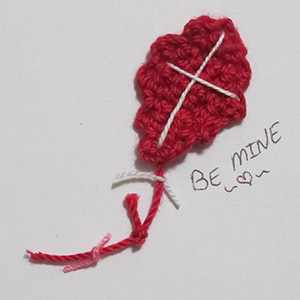 This quick and easy kite pattern paired with plain jane card-stock would make a great card. You could also use this pattern as an appliqué for children’s clothing and accessories. Use pastel yarn for a perfect kick-start to spring project or just add it to your handmade embellishment stash. Fall has always been one of my favorite seasons. I love the smell of woodsmoke in the air. Pumpkins and squash in every shade are being harvested and used for decorations. Oftentimes my squash collection finds its way to my oven. Roasted squash, stir-fried pumpkin, cookies and pies all make my dinner table look absolutely mouthwatering. 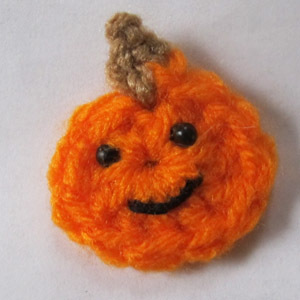 So, when I was thinking up a pattern for this week, this little pumpkin pin found its way off my hook. I added eyes and a smile similar to the happy veggie figurines I’ve seen in Japantown. The other day, while my daughter and I were taking a walk, a little black kitten and his tabby sibling peeked out from among a stack of haybales. While the tabby cat is only interested in getting fed the black kitten we’ve named Miette has become quite loveable. My daughter is so attached to her new little friend. 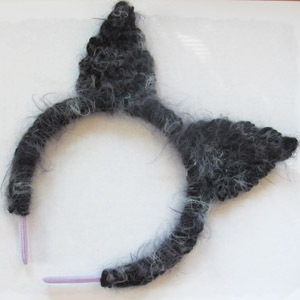 I crocheted this cat ear headband for her to wear while getting her fall photo taken with her new found feline friend. It seems like cat lovers are often crochet lovers, so I wanted to share this pattern with you too. It can be crocheted in a matter of minutes! I love crocheting play food. As a child my mom crocheted me an assortment of goodies to add to my kitchen collection. I will never forget her handmade surprises she’d whip up for me during my nap times. I suppose these early memories are what keeps me coming back to patterns like this. Today I have a zero-calorie ice cream sandwich pattern for you to indulge in. This little project can be made in a matter of minutes and it is great to keep in your toy stash for when little ones come to visit. Don’t forget about the holidays! A basket of play food makes a great gift.